The Paperbark Maple (Acer griseum) is a small to medium sized ornamental with wonderful year round interest. It is a slow growing and long living tree that is recommended for zones 5-8. With an average height of only 25 feet and a spread of 15-20 feet wide it is an ideal specimen tree in any size landscape. It has a rounded crown and open growth habitat, allowing sunlight to filter through to reach plantings below. In early Spring, dark purple-green buds unfurl to reveal three-lobed leaves that are usually three to six inches in length, with blunt toothed margins. Late Spring and into Summer the leaves become a bright green to bluish-green on top with frosty silver undersides. Also in the Spring, the flowers which are often considered insignificant, hang in non-showy inch long clusters of pale yellow-green blooms. Flowers give way to attractive one to three inch red-brown winged fruits in the Fall that may persist on the tree into Winter, and that spread widely when dispersing resulting in very little litter beneath. Late in the Fall, this Maple variety begins its own leaf show – leaves change from yellow to orange, dark vibrant reds, and sometimes even scarlet, crimson, or pink. These leaves hang on the tree well into winter allowing for another level of visual interest. The Paperbark Maple often grows multiple trunks, some even branch out quite close to the ground. This gives it a vase-shaped, and almost sculptured appearance, particularly when the leaves fall in the Winter. 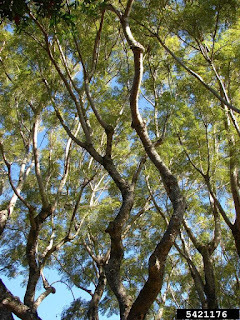 On this particular tree, you want to keep it pruned to see as much of the bark as possible, since that bark is one of the most appealing features and the very reason for its name. The bark is a coppery, orange,cinnamon to red-brown exfoliating bark. The bark that gets darker reaching a purple-brown with age. Bark begins peeling on even very young trees, peeling as early as the trees second or third year. Bark peels in curly, translucent, papery strips that remain attached to the trunk and branches until naturally worn away. After peeling, the bark underneath is smooth, lighter tan, salmon, or even rose in color. With so many interesting features going on throughout the year this tree would make for an amazing centerpiece in any garden. It is especially beautiful against the Bright white Winter snowfall. The Jacaranda tree (jacaranda mimosifolia) is a medium sized shade tree native to South America. It is a deciduous tree that sometimes acts as an evergreen in extremely warm climates. 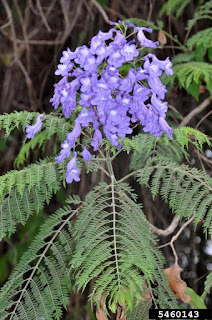 It is also called the Brazillian Rosewood, Blue Trumpet tree, or Blue Jacaranda. In climates outside of it's native or recommended hardiness zones (9-11) the Jacaranda is often grown indoors as a houseplant or even trained as a Bonsai. 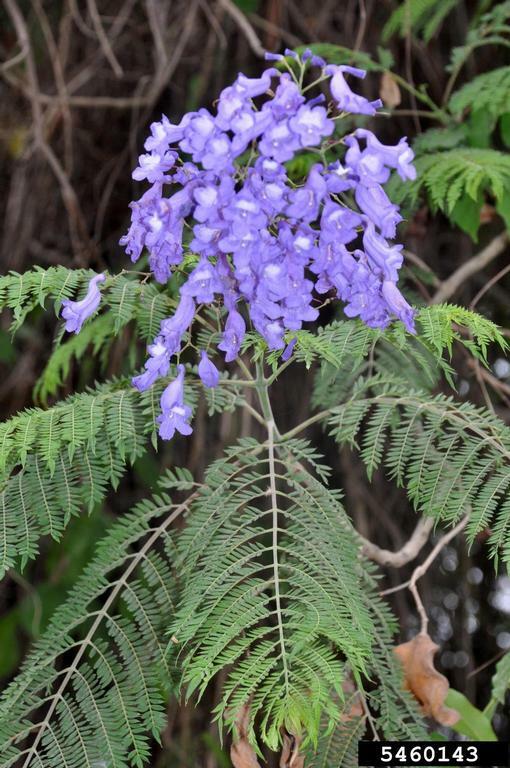 The Jacaranda's leaves are pinnately compound and are 2 inches or less in size. The flowers (arguably the trees most beautiful feature) appear in late Spring to early fall. Appearing in clusters the trumpet shaped flowers are exceptionally fragrant. In warmer climates this tree may act as a semi evergreen and not only retain it leaves but bloom at multiple times throughout the year. The Jacaranda performs best when planted in the Fall. The tree can be propagated from softwood cuttings, grafting or seeds. It has a high tolerance to disease and does not have any notable pests. Also very drought tolerant this tree is used frequently as a street tree in it's recommended hardiness zones. Size at maturity can range from 5-50 feet tall and 15 to 60 feet wide, the size at maturity is reliant on the area planted, pruning schedule and zone planted. The Black Walnut - Juglans nigra - is a large flowering deciduous tree in the Walnut family, growing to heights of 100-130+ feet tall. The bark is a grey-black color that shows deep furrows throughout. The leaves are green during the growing season and are made up of 15-23 leaflets growing in an alternate pattern, chaging in color to a bright yellow in the fall. The roots of the Black Walnut produce a chemical called Juglone (5-hydroxy-alphanapthaquinone), this chemical is known to be harmful or toxic to many other plants and some animals. most notably horses. Horses are effected most when Black Walnut wood chips or sawdust are used in their bedding, exhibiting allergy symptoms (which are worse in the spring) similar to that of humans. Plants including tomatoes, potatoes, blackberries, blueberries, azaleas, mountain laurels, rhododendrons, red pines and apples are known to be severly injured if not killed when planted/grown in 50-60 foot of the Black Walnut. Gardeners should take care when planning a garden around a mature Black Walnut, paying extra attention to what plants are tolerant of Juglone. The Black Walnut is native to the Mid-West and Eastern-Central United States, with a recommended growth zone of 4-9. This tree is used in both nut and lumber production. The trees begin to produce nuts at 4-7 years old and continue annually ripening each October, because it is self pollinating it is possible to have nuts with just one tree. The nut is firm and has an enjoyable flavor.